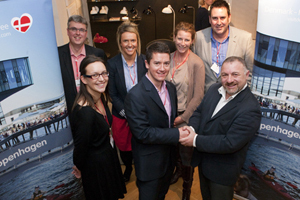 W&O Events was named the winner of the UK heat of VisitDenmark's 2012 MINDchallenge, supported by C&IT, in London last night. The agency fought off competition from Icon Presentations and The Rocket Science Group with their successful response to the brief for an innovative three-day programme for a company conference to take place in Copenhagen. Judges praised the pitch from W&O Events’ team, headed up by business development director Ben Cooke, for its knowledge of the destination and exciting itinerary.